19/11/2018: Earlier today members of the Industrial Workers of the World have taken a delegation of local activists to visit the Greencastle Peoples Office (GPO) in the heart of the Sperrin Mountains where the community continues to oppose the destruction of their environment by multinational Dalradian Gold Ltd.
“Today was a chance for activists to learn first-hand of what the Greencastle community are facing and have faced over the past number of years and the impact gold-mining will have on all of us. We wanted to show our solidarity with residents who have set up the GPO protest camp at the site of the proposed Dalradian Gold mine. 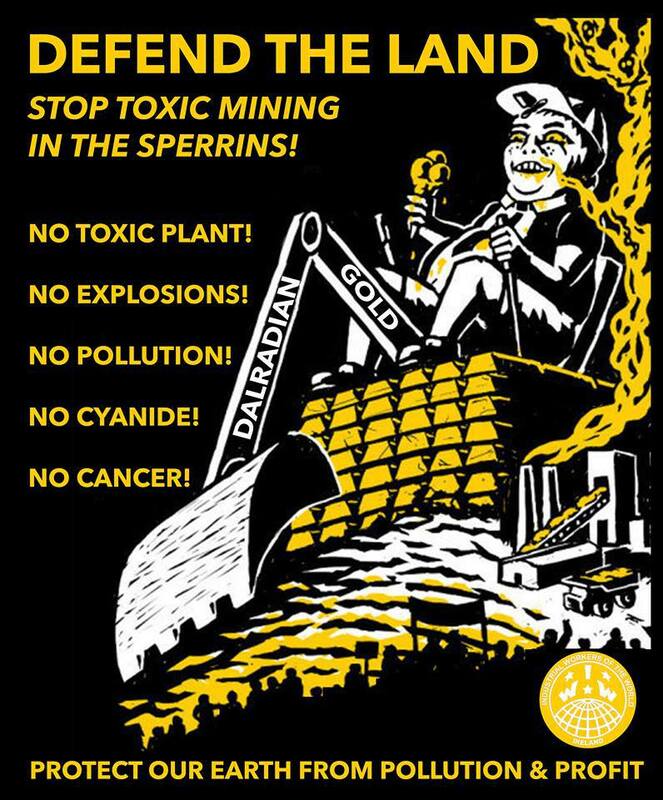 “Following on from today’s visit we would urge the wider trade union movement to acknowledge the destructive consequences of gold mining within a location such as the Sperrins, an area of outstanding natural beauty, as well as the impact it will have upon the lives and health of our communities throughout the entire North West for future generations. “It’s up to everyone who is concerned with the continued environmental destruction of our planet and the health of our communities to show their support for the people of Greencastle and their fight against greedy multinationals. You can show your support by sharing information about the impact gold-mining has upon the land and communities, attend community information meetings and encourage support groups in your area to oppose Dalradian. Write letters of opposition to gold-mining either to Dalradian Gold, your local newspapers or political representatives. Visit the Sperrin Mountain’s and see for yourselves what is at steak if we allow this area of outstanding natural beauty to be destroyed by gold mining, explosions, pollution by cyanide and radioactive poisoning.